My favourite brownies ever. These melt-in-your-mouth fudgy avocado brownies are totally butter-free, gluten-free and dairy-free and taste just as good as regular brownies, if not even better! You can’t help but fall in love with these avocado brownies! Rich and moist, they are also totally good for you. Packed with nutritious ingredients, these fudgy avocado brownies contain less sugar and fat than you’d find in a traditional brownie recipe. Plus, they’re 100% dairy-free and gluten-free. Basically almost everyone can eat them. They do contain eggs so substitute with a suitable alternative, like mashed banana, for a vegan version. What makes these brownies incredibly decadent? The not-so-secret ingredient avocado! This superfood gives all the richness you want in a brownie, together with plenty of extra healthy benefits, and you won’t miss the butter at all. I love using avocado when making desserts, and when I’m not making brownies, you’ll find me rolling these crazy delicious truffles. 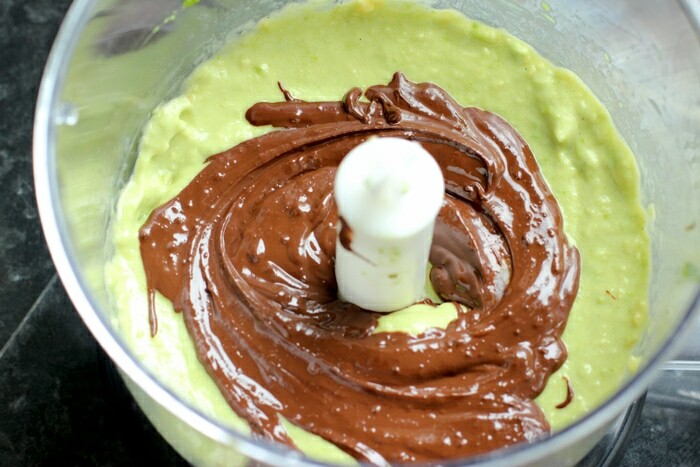 You’ll be amazed of how versatile avocado can be when it comes to baking healthy treats. It’s completely tasteless, but gives a rich texture to the mixture, allowing you to skip other fats like butter or oil. These avocado brownies come together in just about 20 minutes and require super simple ingredients that you probably have in your kitchen already. 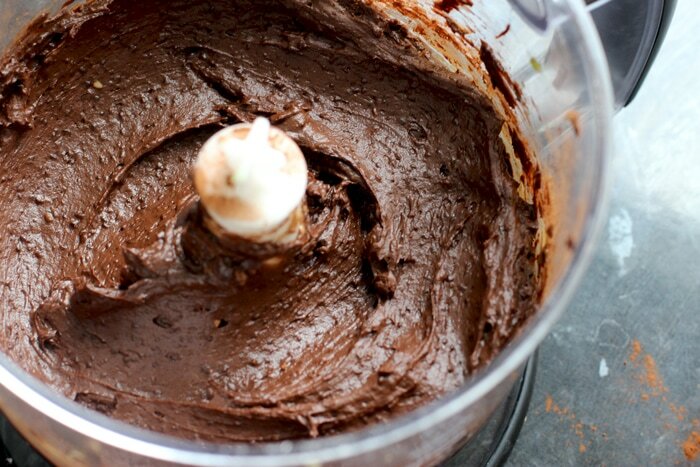 Blend all the ingredients in the mixer, fold them into a brownie pan and bake for 20-25 mins. That’s it. Yes, seriously. 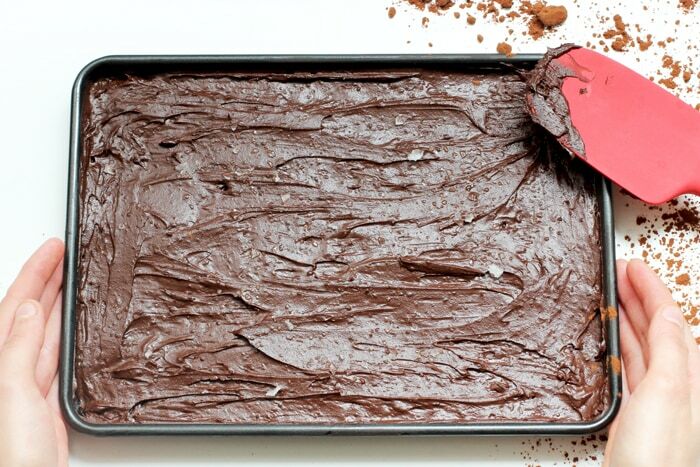 You still need to be a little patient, and leave the baking tray to cool down completely before removing your brownies. Once the job is done, cut the brownies into big chunks and stuff them all in your mouth. The sweet note comes from demerara sugar and manuka honey. I love the deep and rich flavors both ingredients have, not to mention the extra nutrition coming from manuka honey. You can play with your favourite sweeteners of course, and use only caster or brown sugar for instance, but for me, the sugar+honey combo works best. 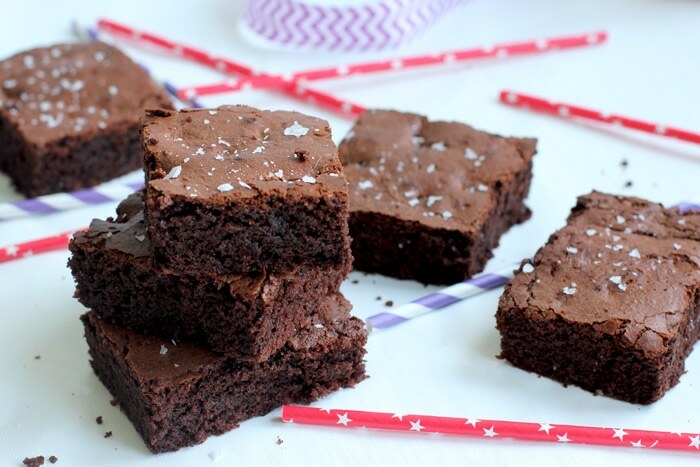 And don’t forget to sprinkle a little sea salt flakes on top of your avocado brownies before baking them. You don’t want to miss the delicious sweet & salty combination. When making the perfect avocado brownies, the chocolate plays a fundamental role. Both in dark chocolate chunks and cocoa powder version, my tip is to choose the best chocolate you have available. Go for a 65-70% organic dark chocolate and use high quality cocoa powder if possible. Being completely gluten-free, there is no flour in the brownie mixture, so it’s super important that you choose your cocoa powder wisely. Common rule is: if you’re using baking soda go for raw cocoa powder, if using baking powder choose Dutch cocoa powder instead. Remember not all baking powder brands are gluten-free, so double-check the ingredients before use. 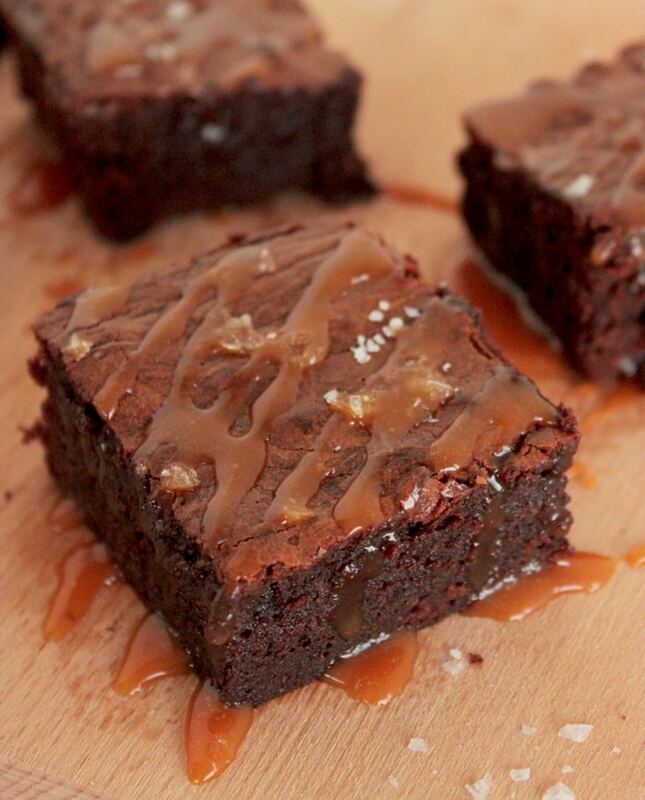 If you’re looking for something more indulgent, add some homemade salted caramel sauce over the top of your brownies *No judging here, I do it all the time shhhh*. These avocado brownies make a fantastic sweet treat, and being on the health-ish side, means they are great to enjoy all-year-round without feeling guilty. Since they’re super allergy-friendly, they would make a lovely addition to parties, birthdays and any other kind of celebrations. Before I forget! If you’re planning a party, make sure you get plenty of inspiration and check more party recipes here. These melt-in-your-mouth fudgy avocado brownies are totally butter-free, gluten-free and dairy-free and taste just as good as regular brownies, if not even better! Preheat oven to 180C/360F. Grease with a little olive oil a 8" baking pan. Melt the chocolate in a heat-proof bowl over a pan of boiling water. Once melted, let it cool a little. 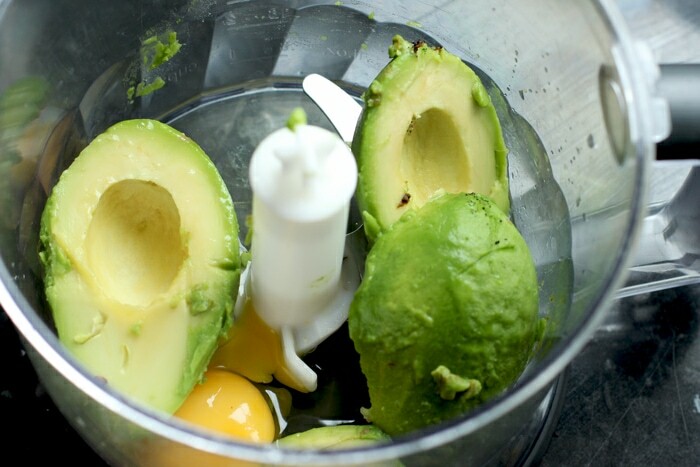 Add the avocado flesh into a mixer, then fold in eggs, vanilla and water. Blend all ingredients until creamy. Add in sugar, cocoa powder, honey if you like and a pinch of sea salt. Mix all ingredients, fold in baking soda and stir until just combined. Transfer the mixture into your prepared pan, levelling out the top and spreading well out the mix to all of the edges. Sprinkle with sea salt flakes and bake in the oven for 20-25 min, or until a toothpick inserted comes out clean. Allow to cool completely before taking out of the pan. Cut into square and drizzle with caramel sauce if you like. Enjoy! These brownies are very fudgy, add 2 tbsp of flour into the mixture to get a bit of cake-like texture. You can also add 2 tbsp almond flour to keep it gluten-free. Originally posted in June 2015 and updated with new info. 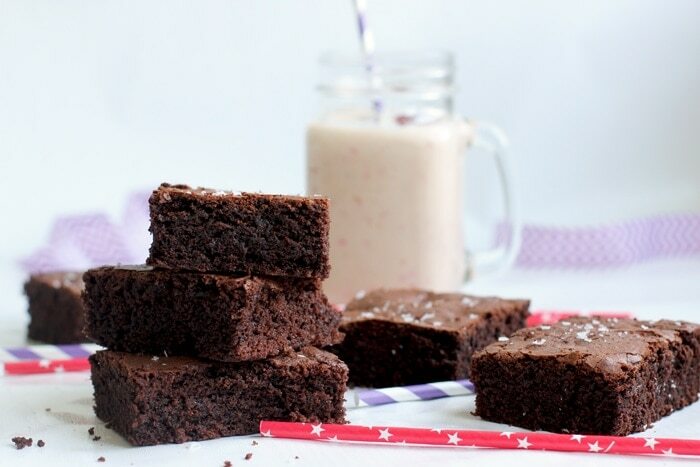 These brownies look so moist and yummy! I love manuka honey but didnt think to use them in brownies. It must be so delicious! Thank you! 🙂 I’m really in love with manuka honey lately, it just tastes so delicious. I usually have it with yogurt or in smoothies, but this time I wanted to give it a little twist :)! These actually look like real brownies. I have a thing against healthy ones actually not tasting like brownies! Will save for future indulgences!! They taste like the real deal Ceri 🙂 My only recommendation is to use over the top ingredients to get best results!